In a zip-lock bag or similar, mix together honey, mustard, vinegar, soy sauce, garlic, salt and pepper. Add pork chops and shake to coat the pork chops. Leave to marinate for at least 1 hour - I left it overnight, turning the bag half-way through. Take out the pork chops and cook in a pan over medium high heat until done - about 3-5 minutes per side. Meanwhile, pour the marinade into a small pot and bring to a boil. Let it simmer for a few minutes until it's a tad thicker. 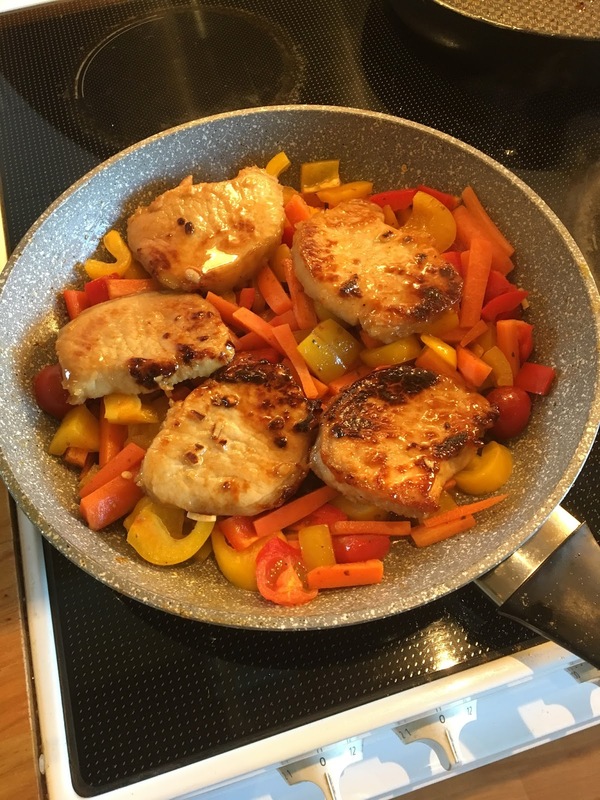 Serve with roasted potatoes and veggies - cooking the veggies in the same pan as the pork chops to soak up the last of the marinade. Really good! The marinade left the meat nice and moist, and worked really well as a sauce as well. I used bell pepper, carrots and tomatoes for the veggies, but you could really use anything. This served 3 people with no left-overs.